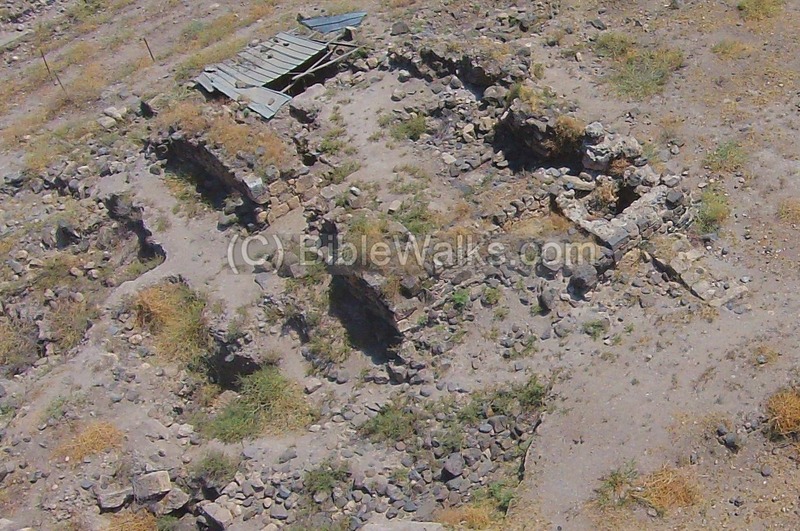 Ruins of a Crusaders fortress, near a key river crossing over the Upper Jordan river. 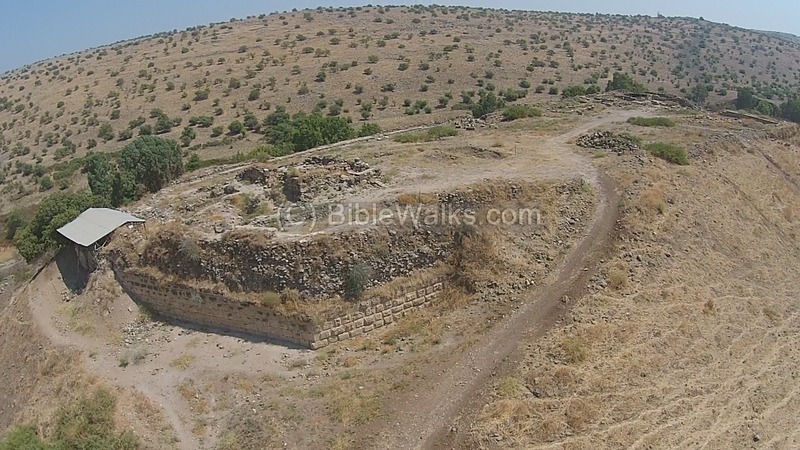 The Ateret castle (Latin: Vadum Iacob, English: Jacob's Ford) was a Knights Templar fortress located on the upper Jordan river, at a key river crossing into the Galilee. Construction started in 1178, but was not finished in time to stand against the forces of Saladin less than a year later. The ruins of the fortress are located on the west bank of the Upper Jordan river, south of the Hula lake and the swaps around it. A shallow river crossing ("Ford") is located 200m south of the ruins of the fortress, at the place where the river bends and splits to two streams. This river crossing, named "Jacob's Ford", was a key pass during ancient times between the Upper Galilee on the west and the Golan heights on the east. This was also the reason why the Crusaders erected a fortress at the site. Several bridges, including the modern bridge of highway #91, were erected in later periods to the north of the fortress. The Crusader fortress was built on the north part of an ancient Tel, adjacent to the Jacob's Ford pass. The mound was roughly 300m (~300 yards) long by 100m (~100 yards) wide. The archaeological survey identified a continued settlement from the prehistoric periods to the Ottoman period. On the south side of the Tel the excavators collected numerous pottery sherds of the Early Bronze period (II-III), Middle Bronze II, Iron Age I-II and later periods. "The sixth lot came out to the children of Naphtali...And then the coast turneth westward to Aznothtabor, and goeth out from thence to Hukkok, and reacheth to Zebulun on the south side, and reacheth to Asher on the west side, and to Judah upon Jordan toward the sunrising". A Biblical map shows the area around the site (marked by a red marker) during the Bronze and Iron Ages. Its location was on a section of Via Maris ("the way of the Sea"), the most important thoroughfare crossing the land. This section connected the strong city of Hazor to Damascus, in the most convenient crossing point south of Lake Hulah (Huleh). The lake and swamps were mostly drained in the 1950s, but in the 1990s some of the lake was restored. During ancient times the lake, with the swamps around it, limited the possible routes. The strategic crossing location remained important throughout all periods, and the reason why the Crusaders selected this point for a fortress. The Crusaders arrived from Europe to the Holy Land in order to liberate the Holy Land and free Jerusalem. They accomplished the mission in 1099, and established the Crusader Kingdom. The leading commanders and the Crusaders elite were Christians of West Europe origin, and therefore the Kingdom is often regarded as the Frankish Kingdom, named after the Franks who were a coalition of German tribes that spread to France and Belgium during the Roman periods. In the second half of the 12th century, the great opponents of the Crusaders were the Ayyubid Muslims. This dynasty was founded by Saladin (Salah ad-Dīn Yusuf ibn Ayyub). The Ayyubid Muslims ruled Syria and Egypt in the years 1171-1341. Saladin, a Muslim of Kurdish origin, was the first Ayyubid Sultan in 1174 and reigned until 1193. His mission was to drive the Crusaders out of the Holy Land and the Levant, a mission that was mostly accomplished. 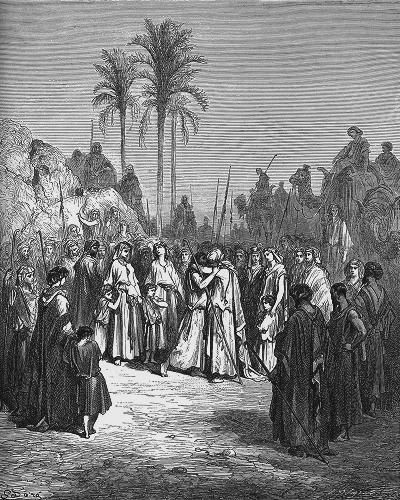 The battle in Jacob's Ford was one of Saladin's early successful encounters with the Crusaders. One of the early chapters of the battles between the Crusaders and the Ayyubid Muslims was written in the site of the Ateret fortress. The Crusaders were surrounded by the hostile Arab world, and therefore they spent fortunes in fortifying the borders of their Kingdom and their main routes. A key route from the Galilee to Damascus passed through a crossing point on the upper Jordan river, at a point south of the Hulah lake. The pass was protected by the knights of the Templars order, who were stationed in the Crusaders' main fortress in Zefat. The Templars were a military-religious organization, established in 1118, naming their organization after the temple: the guards of the temple. Their task, as defined by the pope, was to protect the pilgrims and patients that visited the Holy Land. In 1178 King Baldwin IV constructed a fortified outpost south of the pass, in order to provide a better protection rather then sending troops from Zefat. King Baldwin IV (reigned 1174-1185), also called the Leper, personally supervised the construction from a camp near the construction site. Most of his army and a large hired work force were employed in building the new stronghold. The rectangular fortress, 128m (400 ft) by 61 meters (200 ft), was erected on the northern side of the ancient Tel. The construction started on Oct 1, 1178. The site of the fortress, near a strategic crossing ("ford") of the upper Jordan river, was named by the Crusaders as "Jacob's Ford". This name is based on a Crusaders tradition that Jacob met Esau at this place after they reconciled (Genesis 32:9 and 33: 4): "for with my staff I passed over this Jordan...And Esau ran to meet him, and embraced him, and fell on his neck, and kissed him: and they wept". The fortress was built over an ancient mound adjacent to the river crossing. The defense of the fortress - named "Castellet" - was given to the Templars who protected the pass before its construction. After Saladin became the first Sultan in 1174, one of his first acts was conquering Damascus. The fortification near the Jordan pass, less than a day's ride from Damascus, offended Saladin. At that time it was regarded as a Muslim territory and a sacred site. The fortress would make the crossing of the Jordan river more difficult, thus weakening the Muslim frontier. The Crusaders, on the other hand, felt stronger after their decisive victory in the battle of Montgisard, near Ramla (November, 1177), where the 16 year old King Baldwin IV, with his outnumbered army, defeated the Saladin army. Baldwin therefore seized the moment to strengthen the Crusaders positions, and Jacob's Ford was the right place to expand and change the status quo. 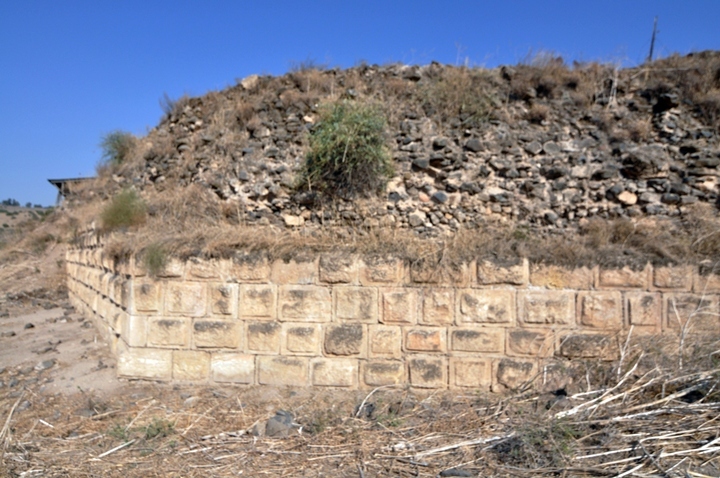 Another frontier fortress was constructed at the same time in Hunin, north of the Hulah lake, which commanded the other road from Tyre to Damascus through Banias. Saladin considered the construction as an act of violation of a truce with the Crusaders. Initially, Saladin offered to buy the fortress. He offered Baldwin to abort the project without a battle, at the price of 60,000 gold pieces at the first offer and 100,000 gold pieces as a second offer. After the Crusaders refused both proposals, Saladin decided to attack. He waited until King Baldwin would leave the castle with some of his army. Both sides first met in battle in the Golan (April 10, 1179), with the upper hand of the Muslims. Following the Crusaders defeat, Saladin brought in more forces from Egypt. He then placed a siege on the Castellet fortress at Jacob's ford (May 27, 1179). At that time the fortress was only partially completed, as the archaeologist concluded that only 75% of the medieval castle was finished, and that an additional external concentric wall was not built although it was planned. The builders were engaged in the beginning of the second phase of the three planned phases of construction when the Saracen forces attacked. However, Templar knights and auxiliary forces were stationed in the fortress and put up a strong resistance. The siege failed, as the fortress was well protected against Saladin's forces, with towers and 10 meter high walls. Saladin withdrew after 5 days to fight and win another battle near Marj Ayyun, north west of Banias (June 10, 1179). After then he returned back to continue the attempts to conquer the fortress (Aug 24). This time Saladin, who commanded the attack himself, found a way to capture the fort: his forces cut a tunnel under the fortress in order to set fire to its foundations. The first attempt failed, but after enlarging the tunnel the fire caused the walls to collapse (August 29). The Muslim forces rushed into the fortress and overcame the Crusaders. King Baldwin, who rushed his army to Tiberias in order to repel the attack, came too late to rescue his men, and watched from afar the smoke rising over the ruins. The Muslims then butchered the 700 Crusaders, throwing their bodies into a well or pit. This proved a grave mistake, as the rotting corpses in the pit caused contaminated the water, and a plague spread among the victorious Muslim soldiers. The exact location of the burial place is yet unknown. The mass grave may have been discovered 50m to the north of the fortress, where a wide pit (4m in diameter, 2m deep) was found. The fortress was then destroyed, only 11 months after the construction started. The fall of the first large Crusader castle was a turning point in the collision between the Muslim and the Crusaders forces, the beginning of a Domino effect that eventually brought down the first Crusaders Kingdom. After his victory, Saladin and his armies became more bolder and their attacks intensified. The battle near the Horns of Hittim (1187) was a climax in the battles between the forces, bringing an end to the Kingdom in the Holy Land two years later. The Ayyubid conquerors erected a mosque on the mound to commemorate their victory. A settlement on the mound continued during this period and the Mameluke and Ottoman periods. Most of the stones from the fortress were robbed and reused over the centuries. 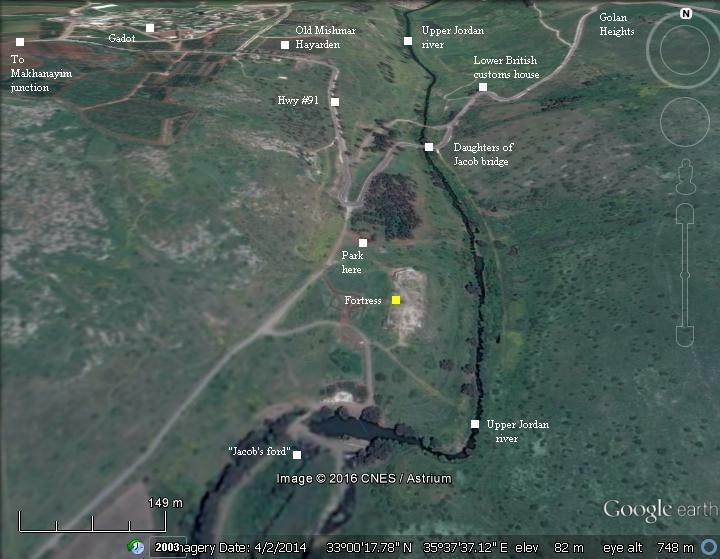 During the Mamluke period a new pass was opened 1KM north of the site, by constructing a bridge. The bridge was named "Daughter's of Jacob" bridge, inheriting the name of the Jacob's Ford pass. The fortress building blocks were reused in the construction of the bridge, as well as in the flour mills along the river and their water channels. "Kusr 'Atra (the Crusading castle of Castellet): This is a rectangular castle, measuring 420 feet long by 200 feet wide. It was built on an isolated tell above the River Jordan, and was surrounded on the north and west by a ditch, and on the east and south by the River Jordan. The place is entirely ruined, though traces of the walls can still be distinguished, and some large well dressed limestone stones are still in position. The majority of the building material was basalt. This castle is mentioned by William of Tyre (book xxii. chap, x.xii. ), where, describing an expedition made by the king with his army into the country on the other side of Jordan, it is said they came to a position called Chastellet, and from there passed over the Jordan by the Bridge of Jacob. splendid limestone blocks either completely smoothed or cut in relief. The casing has been three-fourths taken away. A tower flanked each of the angles of this rectangle, and at the centre of each side a gate was constructed, facing one of the four cardinal points. Within this enclosure nothing is to be distinguished in the midst of the bushes except at the northern extremity, at the highest part of the hill, where is remarked a mass of piled-up rubbish, under which some foundations still in place are visible.'—Guerin". The site is located in an open area, which is easily accessible. Visitors to the site also come to bath in the river or enjoy a picnic in the remarkable area. 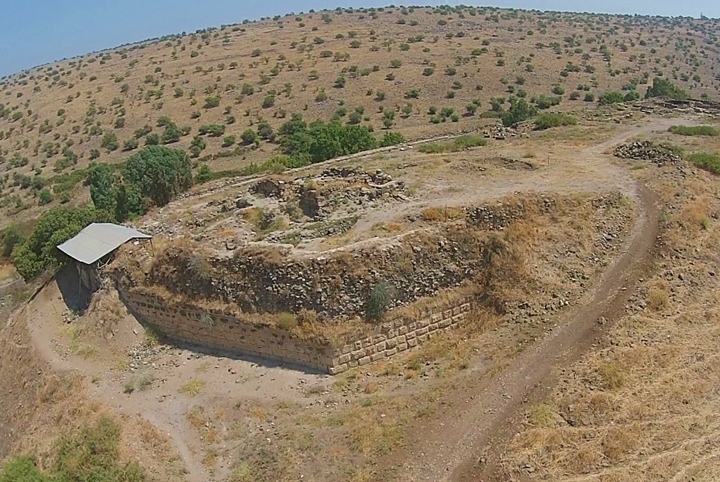 An aerial view of the ruined fortress was captured by a drone from the north west side. The upper Jordan river is seen along the east side of the mound, as a green patch of bushes. It then curves on the south of the mound, in the place of the ford (shallow crossing point). The north side of the fortress is seen in this aerial view. The PEF report wrote about the plan: "The upper surface of the hill is generally flat, and is surrounded by a rectangular enclosure... A tower flanked each of the angles of this rectangle, and at the centre of each side a gate was constructed, facing one of the four cardinal points". The following photo shows a detail in the north west wall, with large limestone ashlars on the lower side, and a pile of basalt stones above it . This was the base of the wall, which towered 10m above the ground level. A moat was cut on the north, west and south sides in order add height and to prevent the enemy to knock down the walls with a battering ram. In the center are remains of the mosque, which was constructed during the Ayyubid period and later renovated during the Ottoman period. The site survey reported other artifacts found on the site: "a multitude of finds including, among other things, coins and metal tools from the Crusader period, iron arrowheads, ceramic grenades, horse skeletons and human bones". According to the study by R. Ellenblum et. al, the displacement was caused by the great earthquake of May 20, 1202 (a 7.6 Magnitude quake, causing a 1.6m offset), then again in the earthquakes of 1759 and/or 1837 (added an additional 0.5m offset). The south side of the ruined fortress is seen in the aerial photo. The bend of the Jordan river, where the Ford was located, is seen on its south side. Jacob's Ford - a key river crossing in the upper Jordan river area, named by the Crusaders after Patriarch Jacob. Le gue´ de Jacob - French name of the castle. Templars: the last stand (TV show, National Geographic, with recreation of the Ateret fortress siege and downfall) - a must see presentation!